But, as far as real spills and treachery go, our bubbles top the list of troublemakers. They’re also one of our very most favorite things, and giant bubbles have been a staple of the program for 10 years. They’ve been hosted on different days because they have so many different attributes and applications, but most recently they’ve been a feature of Thursday’s “Move it!” theme. 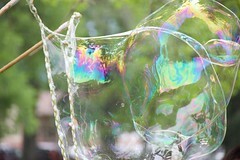 What I really love about bubbles is that there is so much to observe and do with them. First, they make these great spheres of almost-nothingness. They have all kinds of colors; they wobble; they flow around the edges and drip from the bottom; and when they pop they spring back on themselves and then leave behind a shred of their bubble skin. And, when you have buckets and a kiddie pool of our solution, you can blow all kinds of varieties of sizes from straws or wands or pipes or even your own two hands. Our in-house bubble solution is so gooey that it makes giant bubbles. On a cooler day that isn’t too dry, we can get a bubble that can be as long as a car and as tall as a child, streaming out from a loop of cotton yarn as a wobbly iridescent film. The trick to this is a little bit in the conditions and in the cotton loop, but most of the credit goes to the ingredients. Essentially, if you can make bubbles that are more gooey but still liquid, they stay together almost magically. That magic goo comes at a small price. For something that’s mostly detergent and water, it makes a big, slimy, slippery mess. We know this all too well from firsthand experience. Also, the ingredients can be a little weird, but I think that, deep down, this is part of what we like about it. When we were running low on supplies last week, I think that the staff was giggling as they sent me to the store to pick up extra tubes of what’s known as “personal lubricant.” In addition, we keep on hand a bottle of powder that is mixed with water to create a super slippery gel that veterinarians use to deliver calves. This is the kind of stuff that works well for making bubbles. If you’d like to see our recipe and even try it out, we’ve created this annotated copy. On our general recipes page, you’ll see a simpler concoction for bubbles (and other stuff), as well as links for other bubble resources and ideas. Try them out; and by all means please let us know how it turns out or if you run into questions. We love to hear about your own experiments.